Today we're lucky enough to have larger than usual groupings of both the hooded and common mergansers. 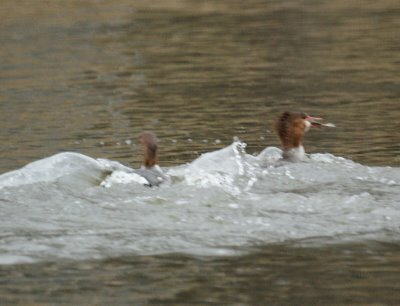 The top photo shows one of the pairs of hooded mergansers that have been floating around Lake Nelson today. The bottom three photos are female common mergansers: fighting over whose fish it is, showing off, and having a bad hair day.